The Anybus Wireless LAN Access Point IP30 is a powerful industrial-grade infrastructure device that can connect several Wireless LAN clients over long distances. The WLAN Access Point establishes a Wireless Local Area Network (WLAN, also known as Wi-Fi) and is ideal for collecting data from nearlying machinery equipped with Anybus Wireless Bolts or Bridges. This IP30 version supports mounting either on a wall or DIN-rail and is suited for mounting inside a factory/building and even inside an electronic cabinet with the use of antenna cable extensions. 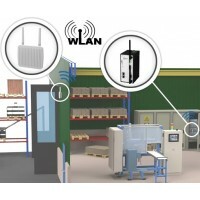 The Anybus Wireless LAN Access Point IP67 is a powerful industrial-grade infrastructure device that can connect several Wireless LAN clients over long distances. This IP67 version is fully waterproof and wall or pole mounted. It's ideal for either indoor or outdoor mounting in a factory or building.